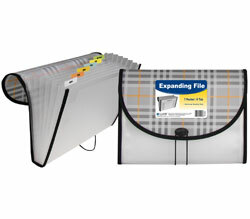 Extra Large Document Cases are made from durable acid-free polypropylene. Extra Large Document Cases are made from durable acid-free polypropylene. Features sewn edges, fabric gusset and elastic closure. For 11 x 8 1/2 document storage. Holds up to 500 sheets. Assorted Tropic Tones colors include Seaside Blue, Sunny Yellow, Seafoam Green, Sunset Red, and Sandy Gray. Minimum purchase quantity is 12 units (one display).